The ledgers now include a delete transaction option within right-click menu. That’s right, you no longer need to edit the transaction first to delete it, you can delete it right from the ledger. This is a huge time-saver if you have a lot of transactions to delete. PRO TIP: Right-click to delete, then press your space bar on the keyboard to acknowledge the warning and delete quickly. We pushed the same preview code introduced earlier to the transactions ledgers into the file library, along with some additional right-click menu options on files. 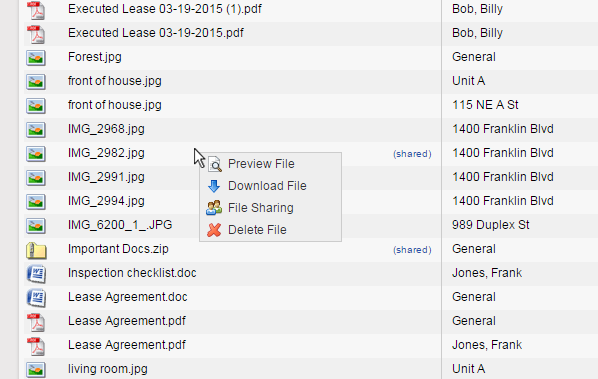 Double-clicking on a file now opens it up in preview as well. We’ve added double-click functionality in many locations. If you have fast clicking fingers, use these double-click shortcuts to navigate around faster. On the properties and tenants lists, double-click the line to enter the ledger. Within ledgers, double-click to edit a transaction. 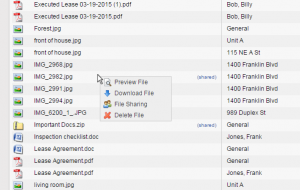 Within the file libraries, double-click to preview files. Within the settings pages (categories, payees, etc..) double-click to view/edit the information. Mac User Tip: Using a Mac with no right click button? No problem; just use CTRL-click to bring up the right-click menu. Learn more about how to right-click on a Mac. PreviousRenew or Move? What Will Your Tenants Do When Their Lease Expires?